"Mr Greenblatt is great at explaining where and how to invest.... He explains in simple, straightforward language the fundamentals of valuing a business, often underscoring with a joke why you need to know all this." "The Little Book that Beats the Market is simple and sincere....you will learn about the technique of value investing from a pro. Greenblatt boils investment jargon down to what you need to know as succinctly and humorously as possible." "The hottest new book in financial circles.... Wow! 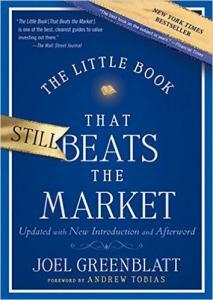 Investing was never this easy....Greenblatt delivers admirably.... It is good-humored throughout, and it contains one of the clearest, most entertaining explanations you'll ever see of the ideas underlying value investing. I plan to pass it along to people close to me who struggle to understand investing and the markets. It's that readable." "Greenblatt is renowned for his spectacular business prowess.... Here he shares his stock selection wisdom with the novice investor. His writing is never condescending or beyond comprehension. In fact, he takes great joy in explaining ideas in simple terms and using arithmetic that he claims even his young children can understand. He also delights in sharing with readers his "magic formula" of finding quality bargain stocks. Lighthearted, witty, and humorous, the overall presentation is a great start for learning about investing and can be used as an alternative to comparable titles in the Dummies series."